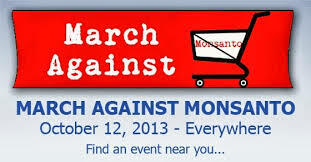 Tonight’s post is a piece I wrote and presented at the March Against Monsanto rally. Many of the ideas, especially the idea of a three part rewilding process- reconnect, regenerate, and rebel- are a collaboration from Wil and I over many years of discussions, experimentation, and hands-on experience rewilding and undomesticating ourselves. Thank you Michelle J. for the video. Under the Chemical Weapons Convention (1993), there is a legally-binding, world-wide ban on the production, stockpiling, and use of chemical weapons and their precursors. Yet Monsanto continues to produce and sell billions of gallons of chemical weapons each year under the brand names round-up, weathermax, roundup powermax, and many others. And in the past, also Agent Orange and DDT. And you can add Dioxins and PCB’s to that list too. And recombinant bovine somatotropin., RGBH artificial growth hormone for cows. And they’ve helped and endorsed and funded countless other toxic chemicals. And I haven’t even touched on the Pandora’s box that is genetic engineering. Or the millions that have starved and are starving because of unsustainable farming methods endorsed by Monsanto chemicals. Or the biodiversity we have lost because of it. These chemicals cause cancer, miscarriage, infertility, learning diasabilities. adrenal disorders, hormone disruption and habitat destruction. They destroy people’s lives and cultures. These chemicals have ruined the lives of billions of humans, animals and ecosystems. And these chemicals have killed billions more. Monsantos crimes are crimes against humanity, the natural world, god itself. What I’m saying, is that these ARE chemical weapons. These are not just crimes. These are crimes of WAR. the closed doors of government offices. A war fought in laboratories, in banks, and on the inside of fat wallets. A war fought in farmer’s fields, in indigenous communities, and inside genetic code. I say Monsanto’s crimes are WAR CRIMES people, and we need to treat them as such. But what can we do, you say? How can we stop them? How can we fight them? we are small and this beast is mammoth! Well I’m here to tell you we may be small individually, but together we are mighty. How do we fight a beast like this you ask? A beast like Monsanto? Well, let me tell you a little story. This beast was born of greed you see. Greed and a touch of madness. This beast was born when we the people started TO BELIEVE we are small. We started TO LISTEN when the corporations told us we couldn’t take care of ourselves without them. We started TO BELIEVE the corporations when they told us we weren’t pretty enough, happy enough, thin enough, full enough, white enough, black enough. And after we started to hate ourselves, they hit us with the old 1, 2. And the corporation got us all confused, and twisted up inside, and sad, and sick, and we FORGOT how to take care of ourselves. And we FORGOT how to take care of our families, our communities. We forgot how to take care of our land, and this beautiful planet. And the information still exists. And we all have the ability to remember it. To remember the way it felt to be confident. To remember the way it felt to take care of ourselves, and our communities, and our planet. And so I’m here to invite you. To incite a great remembering, a great learning from and turning to one another. How do you fight a beast like Monsanto? A corporate beast that eats lives and ecosystems? We learn to live WITHOUT them! We starve the beast!! We slowly, and deliberately turn our backs on what they have to offer. We SHOW them that they have no power over us. We slay them with our own cleverness, resourcefulness, and wit. How do we starve them you ask? We reconnect to our landbase. We sit outside, and we listen, and we watch, and we learn. We learn the Robin’s call, and learn to sing it back to them. We learn what poison ivy looks like, and what stinging nettle can be used for. We learn how to make fire with sticks, how to build water tight shelters with branches. We feel our limbs grow taut and strong, and our hearts grow happy. How do we fight a beast like Monsanto? We learn how to grow nutrient dense, organic food in our own backyards and wild spaces. We learn to hunt. We learn to raise chickens, and cows, and pigs using methods that respect the lives of these creatures. We learn to can, and dry, and preserve foods. 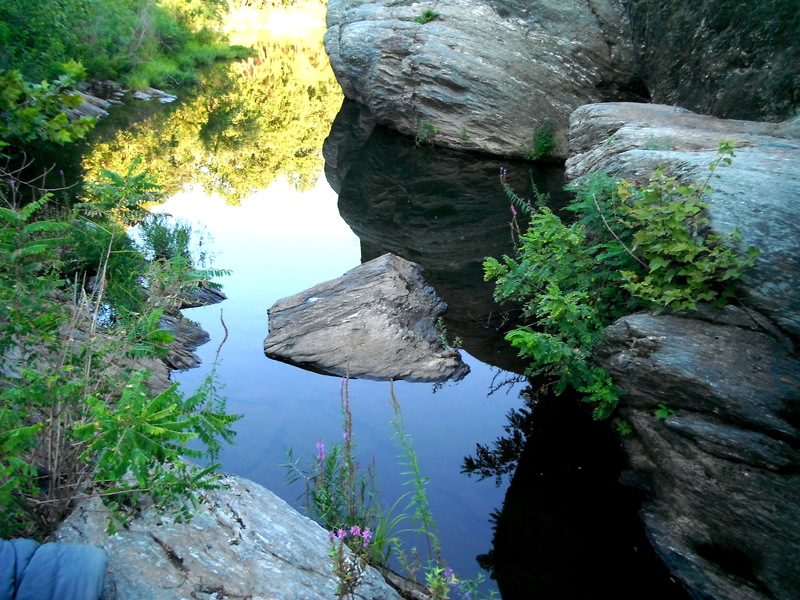 We raise the carrying capacity of the land by planting trees, and plants, and rehabilitating our waterways. We watch the rivers grow full with fish, and know the woods teem with deer. How do we show the corporations we don’t need them? We teach our children. We teach them how to identify the Oak tree by touch with their eyes closed. We teach them to listen, and think before they speak. We carry them close to our breasts, and give them millions of kisses, and snuggle them when they fall. We teach them to think for themselves, to be confident. We teach them the skills that we ourselves are learning. They watch, and they learn from our successes and mistakes. We teach them what corporations are doing to the world, and we don’t sugarcoat it. We show them money means nothing, and personal relationships mean everything. We love them, and we let them be themselves. We gather together just like this, on street corners, in public spaces, and parking lots. We discuss secret things, rebellious things with close friends behind closed doors. We plan rallies, events, protests, and actions. We talk to anyone who will listen. We read. About nature, about the problems with civilization, about history. We teach. How to us plants as medicine, how to grow food, how to hunt, how to make paper. Whatever we know, we share. When we need to buy things we go to shops that know the source of everything they sell, conscious shops, kind shops, like Radiance, and Lemon Street Market. Will those things cost more? Quite possibly, but we get used to buying less, better quality, make it stretch. We learn to be makers ourselves. Of clothing, of electricity, of meals, of houses. We live small, we live with friends,we live with relatives. We work less at jobs we hate, and spend more time with our families, friends, tending wild spaces, wandering in the woods. We make meals together, we sing, we dance, we learn to entertain ourselves. We love one another. We love one another. We love one another. And that’s how you kill a beast like monsanto. You starve it to death. have no power over us. And that, my friends is how we stop this madness and take back our world. This post is a collaboration by Wilson and myself. It is a culmination of many hours of conversations about these ideas. But it was primarily composed earlier today during our afternoon dog walk with Revel in his stroller. Around 1900 the chestnut blight came to america. Creeping in through wounds in their bark, travelling via wind and rain splashing from other trees, the fungal infection spread like wildfire from tree to tree. Within 40 years, the most abundant tree in the Eastern Forest, making up at least 1/4 of all the trees in that beautiful ecosystem, were dead. Because when the ones making money off of the chestnuts, selling them for their prized wood, heard about the problem, they panicked that their bank accounts were going to take a hit, and started desperately cutting down ill, AND healthy trees in an attempt to stop the spread of the illness. Had they thought it through and waited and watched they would have realized that SOME of the trees appeared unaffected. That their limbs stretched healthy and strong, even as the illness blazed around them. They would have noticed that some trees had an immunity. In any population, humans, animals, trees, plants etc. there are always some who show immunity to any particular disease. For example, 1% of our human population living right now is immune to HIV, the virus that causes AIDS. Scientists discovered that this rare group is made up of descendants of individuals who lived in Europe during the height of The Black Plague. The immunity passed from generation to generation and now appears as immunity to HIV. Scientist are working on an HIV vaccine, based on the blood of these lucky few, and have even cured a man in the initial trials. So, if civilization is a disease, a mental illness, a psychosis (remember we talked about the Wetiko psychosis a few days ago ala Jack Forbes) then it stands to reason that there have always been some who are immune to it. And that immunity, to joining the culture of destruction lets say, has passed from generation to generation through our genes. And now, here we are, some percentage of the population, surrounded by the ones suffering from the Wetiko psychosis, the sickness that is civilization. And we are shaking our heads because we just DON’T UNDERSTAND, how some people can just go about their business, consuming and consuming, acting like nothing is wrong, while the world crumbles around us. But then we remember that it is possible to create a vaccine, from the healthy ones, that could cure the sick ones. And the sick ones could become healthy too. And then we know that we must INOCULATE the ones around us who are not lucky enough to be naturally immune. And what does INOCULATION against civilization, against the culture of destruction look like? It looks like reconnecting to ourselves, to each other, to the ancestors, to the land, to God. It looks like educating one another, learning together, cooperating. It looks like regenerating our landbase, to raise carrying capacity and biodiversity. It looks like reclaiming our place in the grand scheme of things. And it looks like rebellion. A standing up, a joining together, and a turning towards a new way. And thanks to MARK N. for the brilliant guest post tonight. Thank you so much for your words and insight Mark! Black- a color for all seasons. I suppose it has always had a meaning for me. Not always a positive one either. It is the color of the end, of humanities (and life in general’s ultimate destiny), the heat death of the universe. A return to a cold, dead quantum soup. Perhaps you glimpse where the Goth/Metal fan in me came from. However, black is also the fertility of the soil and the sharp beauty of its obsidian heart. Out of it comes the full range of color, from daffodil yellow to the red of a wood geranium. Likewise the black depths of the sea, which were born the first seeds of life on this world. One could say black is a color that rebels against it’s own end, if only by being so filled with possibilities. I enter the final half of life even more pessimistic, as instead of the life giving corn goddess or Brigid, humanity seems to be incarnating the Goddess of destruction, an apocalyptic Kali, breathing out coal dust, oil and radioactive poison into the air and sea, her hands collecting more trophies for the skulls already hanging from her great belt. Instead of creativity, it is destructive nihilism that we are incarnating here. We are building a world of cold uniformity, suffering and a bleak worship of authority. Maybe the black flags of rebellion will fly en mass to turn back the tide, but mourning is an appropriate response as life itself becomes more imperilled, the shroud of war and pollution, covers us all, the vestments of a funeral procession. The nurturing hands of soil or the shroud of suffering and extinction. Two ends on an ocean of darkness.Today I fear the charted destination. May all sentient beings achieve liberation. repeat again, and again, and again. I am.